You surely will agree with me that no small business can stay in business for almost 60 years when they are not totally committed to customer satisfaction. The HVAC market in Tucson is very competitive, and newcomers and fly-by-night operations are always ready to pounce on homeowners to offer them “the best deal”… But they will let you down in a heartbeat when it’s high-noon and your A/C breaks at 105°F. Not me. Not my company. Not my technicians. We offer you the best value-for-money deal and we have close to 60 years of history to back up our claim. 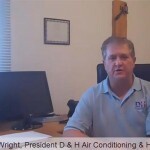 D&H is dedicated to your lifetime satisfaction. It’s not a joke: we have served local residents and businesses for almost 60 years. We plan to serve your home as long as you live in it. But let’s be direct: HVAC technology is more and more complex. Homeowners can’t wrench out their A/C units or call a local Joe like we used to do many years ago. When your AC system is not properly maintained by certified technicians, the likelihood it will break on you dramatically increases. Trained technicians know how to prevent chain-reaction failures, they know to keep your system purring for the longest possible time. Any reliable A/C company will invest much time and money in extra training, better equipment and top-qualified HVAC technicians. This is the price we pay to ensure the comfort and safety of your home, your family (and your business if we are your commercial HVAC contractor). “Fixed Right” Guarantee. Our repairs and the parts we use are guaranteed up to 3 years when included with our Guardian Planned Maintenance Program (based on the term length of your agreement: 1–5 years and renewal). Even if you choose to do your own maintenance(*) or select another service provider, our HVAC repairs are still covered by a 1-year guarantee! (*) Important: You have to know that the manufacturer’s warranty of most HVAC brands will be voided IF you do not maintain your A/C system adequately. In most cases, this means you must have your service done by a certified HVAC technician. Please watch our short video on the topic of manufacturer’s warranty and take the time to read your paperwork. What is the Seal of Trust? 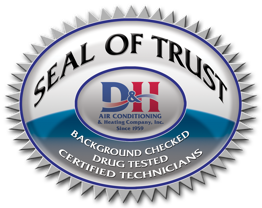 100% of our “Seal of Trust” Certified Team Members have passed drug test, background check, motor vehicle exams and technical training exams. In addition, many of our HVAC service and installation professionals have passed rigorous EPA, BPI, and N.A.T.E training. Our Triple HVAC Guarantees ensure you get the highest quality local care you deserve! Call our hotline at (520) 408-2665 to ask for more details about these warranties/guarantees.